Trial offer for life insurance, one of our secrets to getting you approved! At Huntley Wealth Insurance, when we get a “tough” life insurance case, we are prepared to do whatever it takes to deliver an affordable approval to our client. That’s why we commonly use the Trial Offer. Simply put, a trial offer request is when we send a summary of our client’s medical history to 15-30 life insurance companies. The underwriters review the info and write us back with the health classification at which they are most likely to approve the case. This is how we determine which insurance company is the best to use for a particular case. Whoever comes back with the best offer generally gets our business. For cases where we used trial offers successfully, please see our Testimonials Page and our Success Stories Page. Attach the trial offer to the application – This way the underwriter assigned to the case can see his/her company has already reviewed the case, and will know how they are expected to approve the case. Keep in mind, at this point, the carrier still has not seen your medical records or lab results. One of our agents has summarized your case to them, and they will try to stick to the original offer if they can, but you must understand it is very tentative. So if they find the health of the applicant to be materially different from the original summary provided to them, of course they can rate the case differently than originally quoted. I have a male, age 62, non tobacco, 5-10, 185 lbs. Tinnitis – Ringing in ears dx Jan 2011, did MRI/Cat scan, ruled out brain issues, it is definitely an inner ear condition caused by many years working for a railroad company. Takes Alprazolam (similar to Xanax) as needed when he gets it, which is around 2x per week. Diabetes – Diagnosed in last couple years. Well controlled with a1c of 6.0 to 6.4, takes Tradjenta. Exercises daily on treadmill. 5’10, 185 lbs. A Fib History – In Nov 2008, had single episode of A Fib. Stayed overnight in hospital. It was corrected with medications (took blood thinner for a short time). A fib was reasoned to be caused by heavy stress at work and high blood pressure. Since then, he has retired, and started taking Benicar for BP at the time (which he still takes preventatively). In his first follow up appointment, heart rate was great and has been since. Gets regular checkups with cardiologist, including normal stress tests. Credits – Lifetime non-smoker, household income 200K+, happily married with 3 children who all live nearby. I don’t see any reason for a decline here, but in full disclosure, should mention he was recently declined by Met for these same issues. He needs an approval at Table 4 or better to be able to replace his current policy for less money. Is this possible? Seeking 10 yr term, 100K. This was a great example to send out for trial offer request as we got offers back all across the board, from mild substandard to decline. It saved the client a bunch of time, since he didn’t have to apply to these companies one by one, and we immediately knew which company would approve our case and save him money. The concept of the trial offer is not a big unknown amongst independent life insurance agencies. I know a few other agents who use this tool, such as my friend Jeff Root at www.rootfin.com. The problem is very few do. The reason? Sales quotas. If you go to a big online agency such as Select Quote or Accuquote for life insurance quotes, you’ll speak with an agent who is under the gun to sell 5 policies per day. How hard will that agent work for you when they have a hundred other calls sitting in queue that they could sell. I wrote about this problem in my recent Select Quote Reviews article, and made similar points in my Accuquote complaints article. The agents simply don’t have the time to dedicate to getting you the best price. Do You Have a Tough Case? Let us save you the time and aggravation of further declines. Visit us at elifetools.com today. Great letter. It seems you are very good with impaired risk cases. 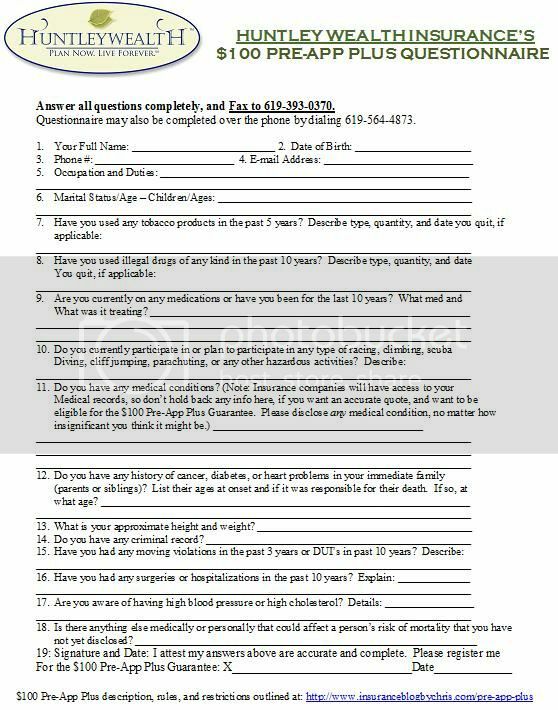 Do you have a standard form you have people fill out that you use to get the trial offers? sir i am a 31 year old dental surgeon from Pakistan. I recently had my aortic valve replaced with a mechanical valve in May 2012. Since then i have had no other complication. My surgery was planned and elective one too. I’m sorry but we don’t do business in Germany, nor could I offer any suggestions for getting health insurance there. I’m a life insurance agent.